“When Impactum came to talk to us about the tree project, we realised that this could be the solution for overcoming our difficulties”, says Aya Odette Brou, from Pogréagui village, 15 km north of Méagui. The project is an example of a ‘payments for environmental services’ (PES) scheme. It was initiated, with the support of the EU REDD Facility, in the context of growing global efforts to stop and reverse deforestation. It is planting seeds of hope among the plantations that now dominate this hot and heavily-deforested landscape in the middle of Côte d'Ivoire’s ‘cocoa belt’. The country is a case study in rapid tropical deforestation. Its forest cover dropped from 50% (16 million hectares) of the total land area in 1960 to just 10% (3.4 million hectares) in 2016. The expansion of cocoa production has been the largest driver of forest loss. But since 2014, Côte d’Ivoire has made ambitious commitments to decouple cocoa production from deforestation and restore forest cover to 20% of its territory by 2030. Private companies have pledged to eliminate deforestation of their supply chains and help restore the country’s forest cover. Mondelēz is contributing to these objectives through its CocoaLife program. As most cocoa is produced by smallholders who sell it — via traders — to large companies like Mondelēz, one possible way to recover forests and reduce cocoa expansion is to convince those smallholders to plant or preserve trees. Yet encouraging smallholders to adopt sustainable practices like agroforestry or replantation is not easy. Most smallholders live close to the poverty line. They lack the means to invest in inputs or seedlings that would increase their yields or provide alternative revenues. That’s where the PES scheme comes in. It offers farmers incentives, such as tree seedlings, technical support for plantation management, and a financial bonus for success. With community-level contracts, meanwhile, the scheme will provide social infrastructure such as schools, clinics and wells in exchange for successful reforestation or conservation actions. Farmers and communities are eager to engage in the project. Interestingly, their main motivation is not so much the ‘payment’, on which the scheme is based, but the prospects of diversifying their revenue streams and becoming more resilient to the climatic shocks like that which they experienced when the drought struck in 2015. As of December 2018, Impactum had signed contracts with 500 tree-planters and trained more than 900 on agroforestry practices. One of the planters is Kouassi Akoura Apolinaire Yao, whose trees saved some of his cocoa crop from the drought in 2015. As well as signing him up to plant trees on his land, the project also trained him to become a “planteur-relais”. In this role, he goes from village to village, training tree-planters, telling his fellow farmers about the project and making them aware of the risks of climate change. 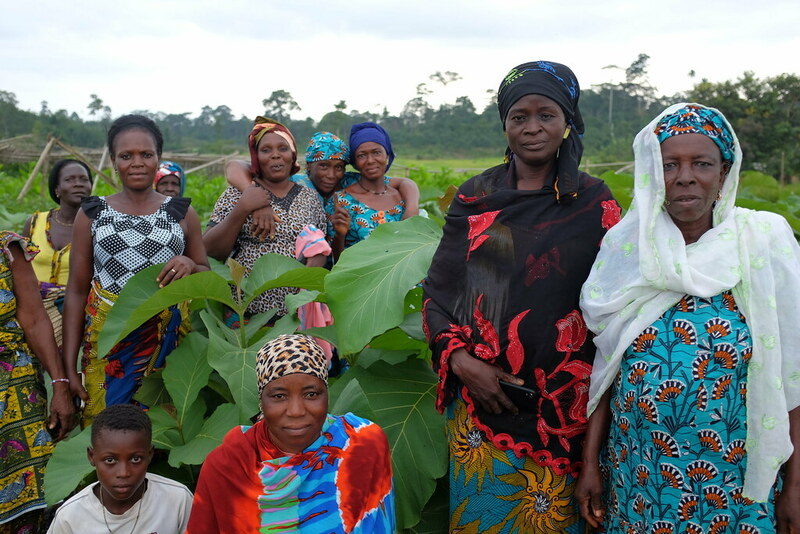 The PES scheme has a specific focus on providing local women with new economic opportunities thanks to Impactum’s cooperation with women-led Village Saving and Loans Associations (AVECs, by their French acronym) that are in charge of setting up and maintaining tree seedling nurseries. Before the project there were no local nurseries, from which planters could buy seedlings. Now women are selling seedlings to the planters, who can pay for them with vouchers provided by the PES project. “It didn’t rain a lot and our husbands’ plantations dried up”, says Amoin Sahoure, President of the AVEC in Assawlèkro. “Thanks to this project, we can help our husbands in supporting our families.” Within a year or two, these women-led nurseries should be running autonomously and could serve planters beyond the scope of the project, which is due to run until the end of 2019. Women are excited about reinvesting profits in the nurseries, and the potential for improving livelihoods. “If we have enough money, we could buy a truck to go the town market and sell our products,” explains Aya Odette Brou, a member of the AVEC in Pogréagui. “We will also help new members who wish to join the project and pay for the children’s school.” The expectation is that in the longer run these economic opportunities will provide a more diversified and sustainable income for the cocoa planters and their families, while the tree cover slowly but surely increases. The project is still at an early stage and it is to be seen what the longer-term impact on Côte d’Ivoire’s forest cover will be. But the chief of the Méagui tribe, Play Christophe Saré, already knows how far he would like to go. “We need to return to nature what we have stolen,” he says. “In our area, we would like to go even further than the Government’s plans and reforest up to 30% of the forest cover”. Through the PES project, the farmers are on the right path — one seedling at a time.